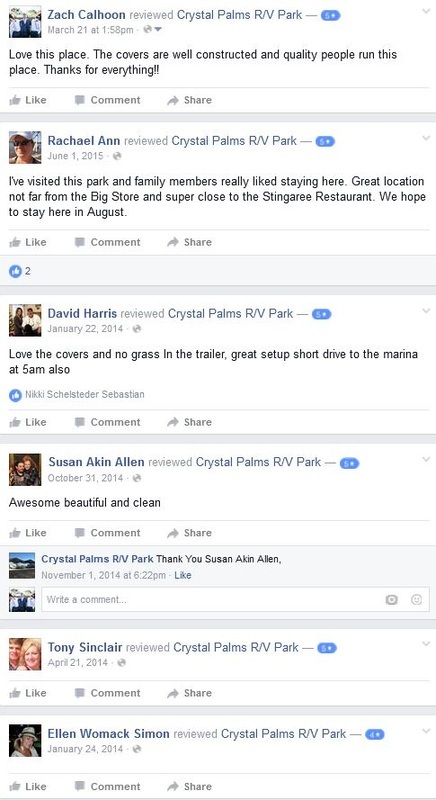 You know you want to come to Crystal Palms because its the best RV Park in the area. But how can you be certain that you shouldn't park your RV elsewhere? Check out this list of things to look for when choosing an RV Park to stay at, and let us know if we don't meet every one of these criteria - and exceed them with flying colors! Bolivar provides a nice opportunity to get away and enjoy the sand between your toes around some of the friendliest Southerners you might ever meet. Can you put a price on that? Some would say it is priceless. Still, we want to be frugal and smart with our money. So when we look to park our one of-a-kind RV, we want to enjoy the stay and not break the bank. This is where you have to consider a few different things. What type of features do I want to include on my stay? Do I want to park on grass? Or do I prefer to park on cement/asphalt? What is nearby to enjoy? Do I want to cover over my lot, or is an open area ok? And do I have the utilities I need to provide a comfortable place to recharge and refuel my RV? All these questions go into the pricing of an RV park lot. We hope that you see our premium location price as "a steal." Many of our customers love Crystal Palms. Check out our reviews! When looking for a qualtity RV park location, you need to REALLY consider the location. At crystal palms, you can walk to the beach, or take a quick trip to Stingaree Marina. Full of restaurants, live music and cold drinks. Your family will love to spend time and enjoy the nightlife at the famous Stingaree Marina. Also, do not forget, Crystal Palms is located very close to the beach. You can walk to the water in less than 10 minutes. So pack up your sun screen, sand shovels and sunglasses. Its time to enjoy the beautiful beach weather. The quality of services is important when making your RV park decision. Do not look back and wish, "Dand, if I only stayed at Crystal Palms, this would have never happened." If it rains, we got you covered. If its really hot, don't worry, just plug into our utilities. Is it a muddy day, and you are worried about getting stuck? Take heart, our location is fully paved. We put the R, in Galveston RV Resort. If you are staying for a weekend or for an entire summer, you are bound to find a great campground here at Crystal Palms RV Park. We want to ensure that you have a comfortable and enjoyable stay - and one that you can tell people back home all about! Give us a call and we can get you scheduled for a stay you won't soon forget.